This list is out-of-date. Please see my Raspberry Pi Christmas List 2015. If you're completely new to the Raspberry Pi, here are my recommendations for UK purchases for Christmas 2014 / New Year 2015. This is the model you want. 512MB RAM, 4 USB ports, ethernet port, smooth power regulator, Micro USB slot. Buy from CPC Farnell; Farnell are one of only two RPi wholesalers, CPC are their consumer division who have free UK postage for all online purchases. They'll throw in a "NOOBS" (New Out Of Box Software) card for a few quid extra, which installs the Raspbian operating system, ready-to-go on high-quality Samsung 8GB Micro SD card (with nice full-size SD holster with Raspberry Pi logo). If you already have a good Class 6, 8GB or above Micro SD card, you could download NOOBS or plain Raspbian yourself, but frankly for a few quid extra, why bother? You need a Micro USB power supply that is capable of delivering at least 0.8 amps (800 milliamps) and ideally 1.2 to 2 amps. Dig out any Micro USB chargers you already have lying around - check the small print to see if they have "output 0.8 amps" or "output 800mA" or above. The Pi itself only consumes around 300-500mA but you're going to want some power spare for a mouse, keyboard and possibly a WiFi adaptor and camera. Anything that you plug in via USB will use a bit more power; some WiFI adapters can use quite a bit, so if you're planning on WiFI, go for a 2amp (2000mA) power supply. 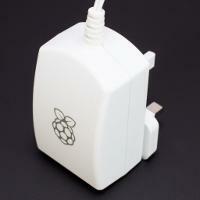 If you don't already own a suitable charger, the official Raspberry Pi charger is very sturdy and powerful, has the official logo, and is a reasonable price. Planning a battery-powered portable project? Get any "emergency mobile phone charger". 4000mAH will last about 6-12 hours depending on WiFi and camera use, and it scales pretty linearly from there; you probably want at least 10,000mAH to get near a full 24 hours, more if you're using WiFi in a weak signal strength area. Go for the rechargable ones rather than the AA-battery powered ones, they have a steadier voltage (the AA ones can make your Pi a bit crashy, especially if you're using WiFi). Having said that, if you see an AA-powered mobile phone charger for stupidly cheap money, under £3, it might be worth a laugh. There are two simple choices in my opinion, and they depend on whether you're likely to want to quickly connect and disconnect a camera, and your attitude to sturdiness. Cheapest is the generic flip-top clear case. This is an open source design manufactured by various people from laser-cut acrylic. 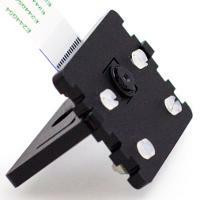 It is very cheap and easy to connect and disconnect the camera quickly. Good enough for desktop use. Instructions for assembly vary from basic to non-existent, but just match up the holes to the ports of your Pi and you can't go far wrong. Don't forget to peel the protective plastic wrap off both sides of the acrylic. Several suppliers on eBay for "Raspberry Pi B+ clear case"; look for the flip top and make sure it's for the B+ (plus) and not the old B.
Pricier but sturdier is the Pibow from Pimoroni, Sheffield. There are several variants, of which I think the Coupé is the best as it allows immediate access to the GPIO pins. On the downside you have to unscrew the top layer to attach or detach the camera. Another mild annoyance is that they used to be compatible with Lego, but are no longer so. On the upside, the Pibows are extremely sturdy and rugged. My top tip: mount the bolts with the heads down, nuts up, as this makes it easier to remove and replace the top layer (for example, to attach the camera). 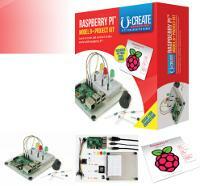 Pimoroni also do a deal which includes the Model B+, the Pibow Coupé case and the NOOBS card. Not much cheaper than buying separately but certainly convenient, and the old-fashioned sweetie-bag packaging certainly is cute. HDMI cable - 1 metre from Poundland, longer from Wilkinsons, B&M, Toolstation etc. As the Pi is small, it is tempting to get a mini keyboard. My advice is, don't do that; get a full-size keyboard. The Pi usually runs Linux which often needs access to unusual keys that aren't on mini keyboards, such as the pipe |, the Page Up/Down keys, the tilde ~ and the Home/End keys. If you absolutely must buy a mini keyboard, I recommend the Genius Luxemate i200, £8.86 + £2.99 P&P from CCL, which has all the unusual keys available (and marked!). Wireless keyboards or mice? Again, my advice is, don't do that; get wired USB devices. 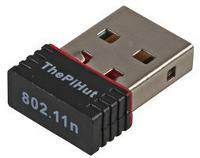 The Pi is a low-power device and the wireless dongle will sap that power. That said, if you have a particular project in mind, go for it, but allow 100-200 extra milliamps from your power supply. Frankly though I think you'd be better connecting through SSH over WiFi. If you absolutely have to have a wireless keyboard or mouse, a Bluetooth one will be a pain to set up; so unless you have an additional requirement for Bluetooth, get a non-Bluetooth RF wireless keyboard or mouse. If you're using a DVI monitor instead of a HDMI TV, you'll need a HDMI->DVI adapter. eBay to the rescue again. Need to connect the Pi right now and can't wait for eBay? Get a HDMI cable from Poundland and a DVI Male to HDMI Female adapter from Toolstation item 67906 for £6.39. Need a longer lead? Toolstation item 98785 for a 3-metre HDMI lead for £8.48. The easiest way to connect to a Pi to the internet, is using an ethernet (Cat5E) cable from the Pi to your home broadband router. However, you can use a USB WiFi adapter. There are two popular types of WiFI adapter supported by the Raspberry Pi's Raspbian operating system out-of-the-box; those are the Ralink 5370 and the Realtek 8188CUS. Others are supported but may require you to install special drivers, not easy for a beginner. Great idea, and cheap. A breadboard, an assortment of female-to-male jumper cables, some male-to-male jumper cables, some LEDs, some switches and maybe a buzzer. The only thing to be wary of is ribbon cables (wide flat cables). The older Raspberry Pi (non-Plus) had a 26-pin GPIO header. Ribbon cables designed for this won't fit the B+ (plus) which has a 40-pin GPIO header. Better to go for a kit which has female-to-male jumper cables which can be plugged in to the B+'s GPIO pins directly. 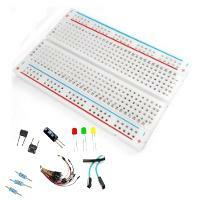 Maplin also sell breadboards, jumper wires and other electronics components at reasonable prices (for High Street). 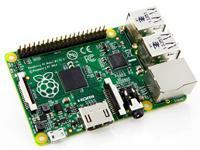 Unfortunately they don't stock the new Plus models of Raspberry Pi, or I'd recommend them more. To be honest I wouldn't get the camera straight away; spend a couple of months learning how to program in Python and use the GPIO pins. That said, it does make a nice present, and it has extremely good image quality (HD video, 5 megapixel stills and good in low light indoors). The camera, like the Pi itself, comes as a bare circuitboard. Pimoroni make a nice mount for it which fits onto cheap tripods (you'll need blu-tack or a 1/4" UNC hexagon nut to hold it on the bolt fitting). Once on the tripod you can use cable ties (or just string!) to tie your Pi to the tripod's legs. U:Create do a great kit which includes a Raspberry Pi Model B+ together with NOOBS card, power supply, HDMI cable, ethernet cable, electronics components, breadboard and user guide. Looks brilliant and the price is reasonable. You'll also need a keyboard, mouse and either a HDMI TV or a DVI monitor + DVI male/HDMI female adapter; see above under "Basic Accessories". Comes with a big flat tabletop mount; you might want to add a smaller case such as the flip-top or the Pibow if you want to make your Pi more portable (see above under "Case"). You could also add a USB WiFi adapter (see "Wireless Internet"). Please note that I don't recommend the Maplins kits at the time of writing (Nov 2014), as they have the older non-Plus models of Raspberry Pi. 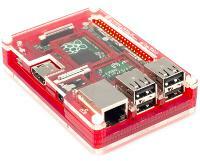 When Maplin refresh their Raspberry Pi range, I hope to update this article. I've used a URL shortener to make the website addresses easy to type if this page is printed out.